Following the post on iPad Apps for Music Education I received a couple of requests to feature a post on iPad apps for teaching and learning piano. And because I don't know any that I would recommend I crowdsourced the topic on my personal learning network and got a lot of feedback from music teachers. Based on these responses I compiled the list below for other piano teachers to consider. I hope you will find the list helpful. Enjoy. The easiest way to play piano, guaranteed. Play with your eyes closed and fool your friends! Tap anywhere on the piano to play the next note in the song. You handle the timing, so you can play it fast or slow. Nota is a set of indispensable tools for musicians at any level. It has a piano chord and scale browser, a piano and staff note locator, a note quiz and a reference library with over 100 symbols. Make sure you also check out Nota for the iPhone to take all of these tool in your iPhone or iPod Touch. For beginners, Nota's tools covers the basics of music notation with a 4 octave piano that displays the notes on a staff, a full screen landscape mode piano for practicing and an interactive notes quiz to test your knowledge of notes. Learn to play the piano, create your own songs and even sing to your compositions! 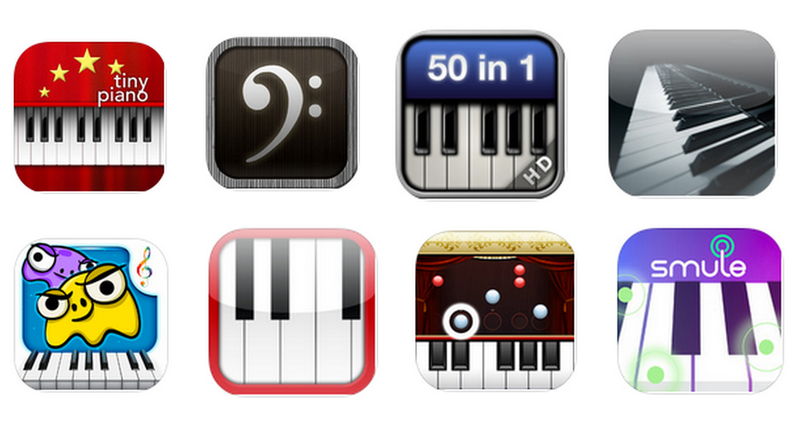 50in1 Piano HD lets you do all that with one single app! It combines a piano keyboard, 50 studio-quality instruments, 120 piano lessons, real-time effects, 100 beat loops and much more in a user-friendly interface. MusicalTouch includes 5 different instrument sounds available to play: Piano, Guitar, Organ, Synth, Electronic Bass. Each instrument has FULL volume and pitching support! Customize the volume of the keyboard keys and drum loops individually to your liking! Pitching for all keys available to fine tune the sound of each instrument as well! Pro Keys is a multi-instrumental polyphonic keyboard equipped with sounds of legendary synthesizers. Application features unique and truly playable interface with 2 independent piano/drum keyboard modules and 17 studio quality presets. Additional features like overdubbing, loop player and vocal recorder make it a perfect tool for song writers, beatboxers or just for fun. Enter a tone row by touching the staff or playing the piano keyboard. Derive rows using Hexachords, Tetrachords or Trichords with the touch of a button. Color blocks help keep track of the different groups. Twelve Tone lets you know if any notes are repeated by highlighting both notes, checking enharmonic values regardless of octave or accidentals. Save your rows (rows may contain from 1 to 12 notes), complete with name and current P, R, I, RI matrix markings. Saved rows appear in a list with their name and midi numbers to help you identify them. To update a row, load it, work on it and save it. Then delete the old one, or keep it as an archive. Edit the name of the currently loaded row by just touching the name on the blackboard. From Bruno Mars to Mozart, play the hottest songs effortlessly on the #1 piano game, also available in HD for iPad and iPad mini! Get free songs every day and enjoy the largest catalog of songs in any piano app. Turn on game mode to unlock achievements and free songs, or just relax and play your favorite tunes. Join the over 25 million Magic Piano players and experience the fun of playing piano - no lessons needed! Activated by an acoustic piano/keyboard, or by touch. No wires or adapters needed - the app just listens to your piano and you learn how to play. Two playing modes to choose from for both players who know how to read music or not! Help Granny dust off the piano by playing the correct note when the germs hit the rhythm line while collecting points and bonuses. Connecting via a network, you can play against 4 people on a piano battle! With Piano Lesson PianoMan, you can enjoy your performance even if you don't play piano.As shown on the screen, just press the piano keys according to the timing and practice your piano recital! Piano Notes!" will help intermediate learners to associate notes on the bass and treble clef in the keys of C, F, G, Bb, D, Eb, A, Ab and E (0-4 flats, 1-4 sharps) with the correct piano keys.3 Challenging Game Modes: Arcade, Count-down, Endless.